Building a collection of horse jewelry is a rewarding pursuit: you’re building a heirloom, legacy array that reflects both your personal style and your love of horses. A horse jewelry collection can start with any piece, at any age. How many of you reading this remember the first pair of stirrup earrings you ever bought — maybe long before you had a horse of your own? The pendant hanging around your neck might be the closest you come to owning a stable full of spirited Arabians — but it’s an effective symbol of your most cherished dream, your secret hope, your ‘someday’ reality. What are the essential elements of a horse jewelry collection? What goes into building a suite? First, consider your personal style. 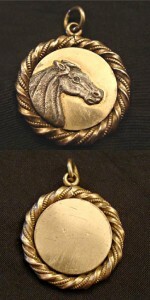 This is your horse jewelry collection, it should be all about you! If you like bold, modern pieces in sterling silver, collect bold, modern sterling silver equestrian jewelry! If you like the classic lines and elegant styling of the Victorian age, collect Victorian era or reproductions of Victorian era equestrian jewelry! Second, consider quality. A good horse jewelry collection should withstand the perils of time! It should be as long lasting as your passion for horses! Invest in the best pieces you can afford. Workmanship and materials matter. Third, consider lifestyle considerations. The type of work you do, the time you spend in the barn, and other considerations should influence your horse jewelry collection. You’ll get more enjoyment out of your collection if you can actually wear it — so selecting pieces that are appropriate for your lifestyle will allow you maximum joy from every piece!